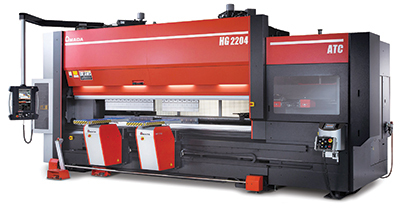 Amada will demonstrate three innovative machines at FABTECH that feature advanced automation for multiple processes: the 9-kW LCG 3015 AJ fiber-laser cutting machine with automated material handling; the HG 2204 ATC press brake equipped with an automatic tool changer (shown); and the HG 1303 Rm robotic-bending system. The 9-kW LCG 3015 AJ enables fabricators to gain process-range expansion by providing the ability to cut a full range of thicknesses and a wide variety of materials including brass, copper and titanium. The machine’s Cycle Loader reduces changeover times and provides a flexible, cost-effective solution for small-lot production. The modular CL allows fabricators to add a material-storage tower to enable lights-out production. The HG 2204 ATC press brake (pictured) reportedly ensures quick and precise automated tool changes regardless of complexity. The automated setup and repeatable accuracy allows fabricators to introduce rush jobs seamlessly. In addition to the machines making their North American debut in Las Vegas, Amada’s new HG 1303 Rm robotic-bending system will demonstrate automated bending of large parts via live feed from the firm’s Schaumburg, IL, Solution Center.